Notepad be gone, now when you’re surfing the web you can browse and take notes within your browser. Um, just be sure to save it! 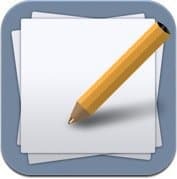 Usually when I need to take notes on a PC, my goto app is Notepad as it’s a quick, dead simple word processor. While it usually works just fine, a new trick I’ve discovered is just typing notes directly into my web browser. How? With a simple code snippit that works with most web browsers in a new tab. 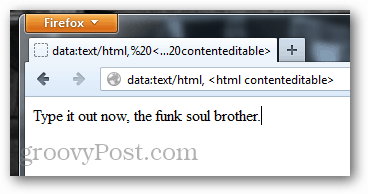 Just copy/paste it into any browser tab address bar to transform the tab’s window into a text box. I’ve tested it with Chrome, Firefox, Opera, and other webkit browsers without any problems. Unfortunately it doesn’t work with Internet Explorer, and I haven’t tested it in Safari (I don’t own a Mac and Safari for Windows is a poor life decision). Memorizing this code of text is probably not ideal, so the easiest way to make use of it is to create a bookmark. You can add it the classic browser Favorite method, or just drag it to the bookmark bar. I changed the name of mine to “Take Notes” after creating it. Important! – This is a groovyHack so be sure to save the page before you close it as it will not prompt you to save before closing. In Firefox and Chrome saving the page can be done from the File or Settings menu. As mentioned, when you try to put the code in Internet Explorer it will just throw out an error. Nifty and practical way of saving notes. Thanks Austin. Now here’s another trick your readers maybe interested in. Use your browser (Firefox/Chrome) to explore your folders instead of Windows explorer. Just type into the browser window the following (file:///C:/) and hit enter. Enjoy! Works on my Mac OS 7 w Safari and Chrome. HOW EXACTLY do you change it’s name to ‘notes’ or whatever?